In a potentially influential change in search norms Google has moved their Google Places business pages to the social media platform Google+ under the new moniker Google+ Local. All existing Google Places pages have been automatically moved to Google+ Local seamlessly so page owners do not have to worry about major profile updates. Business owners can still log into their Places account but will be gradually moved across over the next few months. The Google+ Local page is intended to be a more rounded profile for businesses (see Figure 1). Visitors will see content like reviews, ratings and photos as before but now the page integrates social media also by offering Google+ account holders the opportunity to see what others in their own social “circles” have said about that business. The new Google+ Local page that replaces the former Google Places page, shown here for Charleville Lodge Hotel Dublin. Businesses that have not yet created a Google Places account or a Google+ account are losing a valuable opportunity in search. Good interaction with, and management of, your Google+ Local profile will likely contribute to better search engine optimization and therefore higher positioning in relevant search results. With the integration of highlighted reviews and social media it will be increasingly important also to interact with your customers online, since much of this information will now be visible directly from search results. The change is part of an increasingly strong push that Google is giving to its social network platform, integrating it throughout its services in an attempt to out-social rival Facebook. In tandem with the change, Google also now provides a much richer level of information in their organic search results. The new Google+ Local page will replace the old Places page that can be accessed through the map feature on the right hand side of the search results. 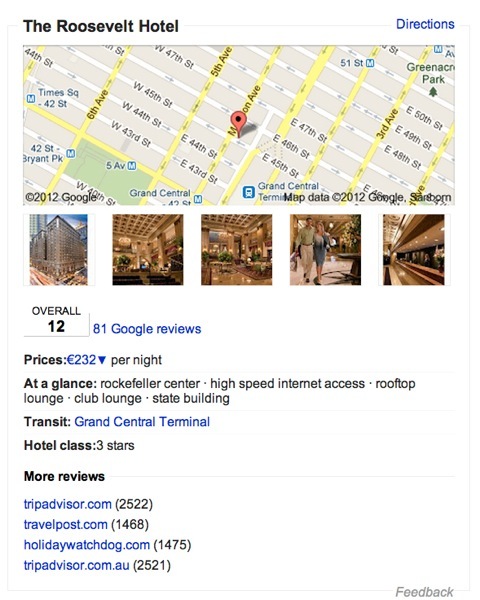 The area below the map (see figure 2) contains useful information on the business such as Google+ Location pictures, Zagat ratings (Google’s recently purchased restaurant rating system), Google reviews, price comparisons, profile information and links to third party review websites. If the searcher is not already a Google+ member there will be a prompt to join for access to more information, evidence again of Google pushing the searcher towards their Google+ social platform. The extended info on the map section of Google’s search results page. On the left where the organic results appear Google has also integrated extra information for the searcher (see figure 3). Under the usual search results they have added a bar with additional intelligent user information. Again they have integrated a Zagat rating that takes an average of user ratings from the Google+ Local business page and scores it out of 30. Next is a Google reviews link and finally a product price listing. This link has a drop down selection which compares prices accross multiple websites while highlighting the official website link. In the case of hotels, featured pricing sites are booking.com, Hotels.com etc., and one can compare rates on particular days through a check date selection box. Additional information and interaction is now possible directly on search result listings. Google+ Local looks like it’s going to be an essential element of a hotel’s online marketing efforts since so many hotel customers interact with social media and reviews when making a decision on where to stay. 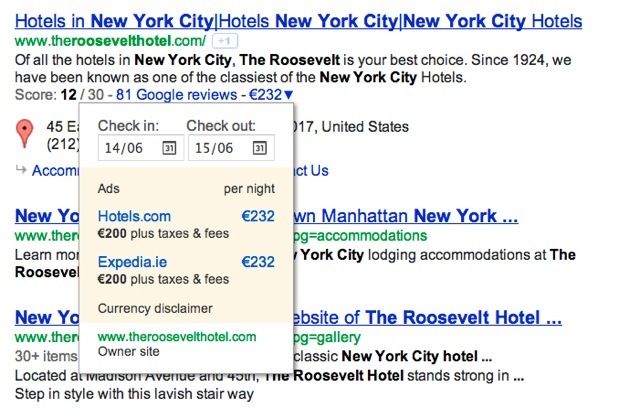 The new changes in search results integrating rich Google+ Local page information directly into organic results means that hotels direct booking potential will certainly be affected. Interaction with the searcher, your potential customer, and good management of your business’s Google+ Local page will be essential in keeping your online reputation in good condition as search enquiries will bring up Google reviews and comments from members of the user’s personal Google+ “circles”. Such personal recommendations from others who are known to the searcher have a much stronger influence than reviews from strangers. It is very likely that businesses who use the maximum potential of their Google+ Local page will be rewarded with better SEO and search engine rankings. Finally a big factor is the price comparison feature that compares rates across other sites and online travel agencies for any given date selection. 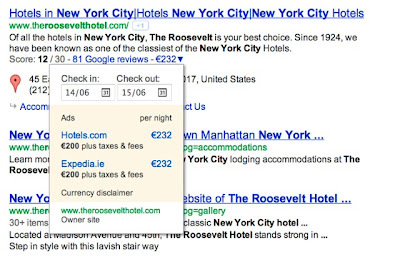 This means hotels will have to always keep best rates on their own site as price comparisons are easily and immediately viewable in search results. 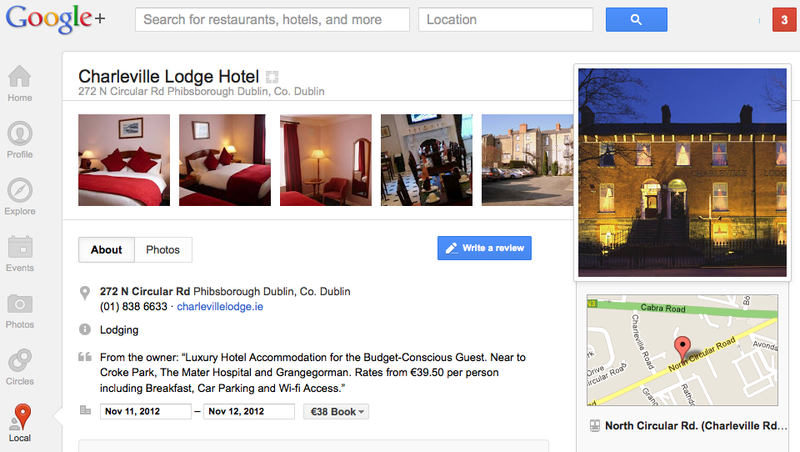 These steps are likely to be just the beginning of the changes Google intends to integrate into Google+ Location pages. If your business hasn’t set up a Google+ Local or at least Google places page, now is the time to do it. The changes are intended to provide the searcher with richer and more transparent search results. Since it will directly affect hotels’ online presence and direct website sales there is no choice but to get involved and stay involved. The very first mode of apparatus was to make sure that all of our clients had taken full ownership of their Google+ Location profiles. This made sure that each hotel has maximum control and thus effect their Google+ Location profile has for both users and search engines when showing up in results. A full and complete description using maximum allocated space and features provided. Correct Hotel information, Address and Map location. Clear and concise text descriptions. Featured Hotel services and USP’s. Advised Hotels to display quality images of their property on their profile. Also as part of online visibility as described in the article Google have integrated price comparisons directly into the search results making these comparisons clearly visible and accessible to the searcher. Bookassist are constantly communicating to Hotels the importance of at least rate parity if not best rates available on the Hotels direct website as a very important part of the over all direct bookings strategy. Hotels always keeping to this practice ensures that price comparisons in search engine results will always reflect well for a hotels online reputation, customer loyalty and direct bookings strategy which are all key elements in optimising your online revenue. Specific Address and Map location is correct. Added keyword friendly text to Hotel descriptions. Made sure Google+ Location profile is 100% complete in order to get maximum weighting by google in the search engine results. The Traffic Builder Team at Bookassist are monitoring Google+ Location for issues, changes and updates in order to make sure our clients are maximising the potential of their profiles both to visitors and to search engine rankings.